by 3 pm to pick up my car. Not sure about that decision now that I've had an afternoon with my Fiat. It's a Tipo 4 door hatchback giant of a thing. And, to top it all off, the collision insurance that comes with my WestJet credit card is no good in Portugal. The Portuguese government requires collision insurance to be purchased with the car rental so my price doubled! Oh well, the car allows me to go where I want to, when I want to and I'll see a lot more of this beautiful country. I came to Amarante and am staying in a nice hostel, alone in a two bed room. It took me forever to find the hostel; I went by it and had to park and call and then go around because the streets are one ways. Luckily the second time around there was a parking space right out front. They gave me a map to get to the parking lot but do you think I could find it? I drove back and forth, back and forth. Finally I called and the poor girl at the desk really didn't know what to tell me. Finally I stopped and asked a fellow and he was kind enough to drive and show me the turn off. Already I've met some awesome people here compared to the ucky Spanish. I think I can count on one hand how many helpful/kind/nice Spaniards I met. They are so arrogant and rude! The Portuguese seem much nicer, so far anyway. 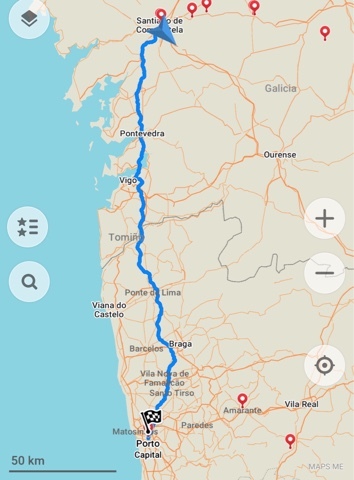 So, tomorrow I'll walk a few meters from my hostel and see an old bridge and church then head for Paso de Rejau which is in the heart of wine country. I'm not going to take a tour; I've done that and can visit a winery and take a boat cruise for a lot less than tour companies charge. Here's hoping for an accident free three weeks! Make sure you get down to Sagres. Lagos is a nice town down in the south. Nice drive along the western coast. Went to the beach at Odeceixe just up the coast from Sagres and Lagos watching the kite surfers. Get to a Fado guitar show in a local pub. Enjoying your posts. Sabres is on my list for sure. I'll check out Odeceixe too and I'm planning to see fado as well. Glad you're enjoying my blah, blah, blah! Got your winter escape booked yet? Yes, Jan 3 to Feb 22 in Guayabitos. Working on ideas for a fall trip to southern Europe. Spain to Greece I think. Hope there's a ring road around Lisbon for you! Hi David, it was great to see you too. Hopefully it's not another 15 years! Take care!